Could This Be the First Female Carrier CO in History? Don't forget this name: Capt. Amy Bauernschmidt. Bauernschmidt made history in 2016 when she became the first female executive officer of a U.S. Navy aircraft carrier. Now, many think she may become the first woman to command a U.S. aircraft carrier. Bauernschmidt is currently the XO of the USS Abraham Lincoln. In 1994, as she was about to choose her career path and graduate from the U.S. Naval Academy, the rules changed. 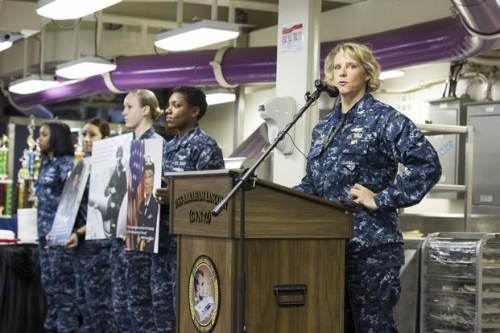 Congress lifted the ban on women serving on combat ships and aircraft. Doors previously closed to her as a woman in the Navy were now open. "For the United States Navy, what it did was open up our ability to go on warships in areas of conflict," Bauernschmidt said in her hometown of Milwaukee. "Up until that point, in all the previous classes that graduated, women did not have that opportunity." She chose the aviation route, flew helicopters, and did several tours on both coasts and overseas. She also served as an instructor and as a liaison to the State Department on global women's issues. After completing the Navy's Nuclear Power School in Goose Creek, South Carolina, she was chosen as the first female XO to serve on a carrier. Asked about her role in history for a Navy news story, Bauernschmidt referenced her mother as a pivotal part of her success when she said, "I take it all back to something I learned very early on from a very important woman in my life. Never pass up an opportunity." Bauernschmidt may be on her way to becoming the first female carrier commanding officer, but first she'll leave the USS Lincoln for her next job, as CO of the USS Anchorage, a San Antonio-class amphibious transport dock ship. Following that tour, she will be screened for another command and, if things work out, she could get the nod to be a carrier CO.